In keeping with the government’s agenda of pursuing alternative energy resources, a new solar park has been opened. The government of the United Arab Emirates has facilitated the park, which is located at the Thomas A. Robinson Stadium. An official opening ceremony was held at the site on Monday, March 18, 2019. Prime Minister, the Most Hon. Dr. Hubert A. Minnis gave the keynote address. 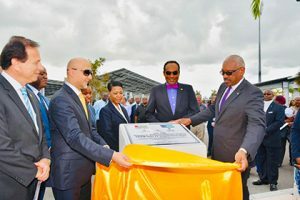 The Thomas A. Robinson National Stadium 925kW Solar PV Carport Power Plant in Nassau was developed under the US$50 million UAE-Caribbean Renewable Energy Fund (CREF), and is the largest renewable energy initiative of its kind in the Caribbean region. Developed in partnership with the Bahamas Ministry of Environment and Housing, with initial concept support from the Rocky Mountain Institute — the project additionally serves as a carport with 342 parking spaces, including two spaces that are equipped with fast-charging electric vehicle charging stations. Expressing his gratitude to the government of the UAE, Prime Minister Minnis said such facilities are part of the government’s vision to bring renewable energy resources to the country. He said the energy generated from the solar panels would feed into the national grid and, based on his understanding, would offset some of the electricity usage of neighboring schools. Minister of the Environment & Housing, the Hon. Romauld Ferreira also delivered remarks. He said he was especially excited about the park and was looking for more opportunities to expand renewable energy resources in the country. Representing the UAE at the inaugural ceremony was Ambassador of the United Arab Emirates to Cuba, Haiti, and Jamaica and Representative to the Association of Caribbean States, His Excellency Bader Al Matrooshi, who said the event represented a major milestone in the relationship between The Bahamas and his country. “Today is a proud moment for strong bilateral ties between the United Arab Emirates and The Bahamas,” said His Excellency. The landmark project, he noted, sets a regulatory precedent for renewable plants to feed into the grid.